I made up Lego Geometry to get my nephew excited about area and perimeter. Kids can create big areas by putting legos side by side, or find the area of single bricks. Tell kids not to stress if bricks don't fit perfectly on the grid paper. They can round up. 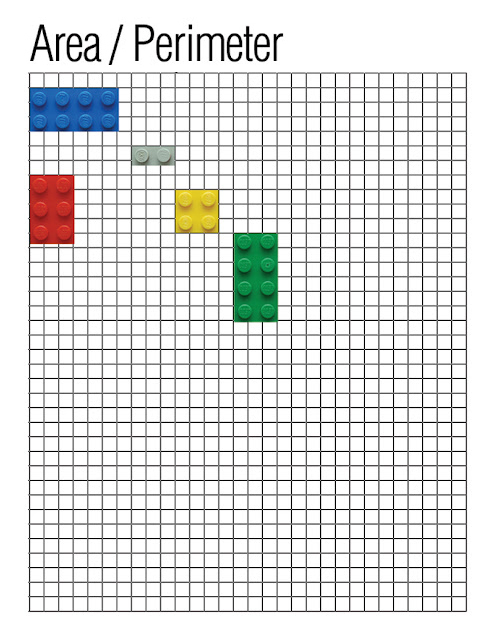 Have them color the area of each of their legos on their grid paper. (Note: For younger kids, you can have them count the lego studs / dots on top to find area and perimeter). Could you possibly add a grid paper template? Foi bem colocado seu comentário, serviu pra mim, para aplicar com meus alunos na sala de aula, muito bom! Oh man these activities are great! I can't wait to use all these Legos! We used to use lego in place of quisinaire length rods when my son was younger. If you happen to be stuck for gridpaper, this has some nice extras and works on iPad, Chrome, Firefox. It has some other nice things like counting beans, you can use it do do long multiplication, by putting a digit in each grid square. Its handy when you want to explain multiplication as rectangle area and introduce Distributive Rule etc. Enjoy, would love your feedback as we make GridMaths more useful. Awesome web 2.0 tool! I'll share a link to it on E is for Explore. Just a thought: If you let the younger kids count the dots/studs on the Lego to find the area and perimeter, they are going to incorrectly assume that the area of an object will always be the same as its perimeter. This could cause a lot of confusion down the road.